Marathon is known as the "Heart of the Keys," due to its central geographical location. The Marathon Area consists primarily of the following Keys (just a fancy name for "island"), from north to south: Long Key, the Conch Keys, Duck Key, Grassy Key, Crawl Key, Boot Key (where Marathon is), and Pigeon Key. Marathon is known by many visitors for being the home of the famous Seven Mile Bridge (picture on right). Alongside the Seven Mile Bridge is the old bridge, now a tranquil, long fishing pier. Let's go through the Marathon area and it's attractions from north to south. Long Key State Recreation Area (MM 67.5) consists of 965 acres of land offering opportunities for swimming, fishing, canoeing, hiking, and much more. 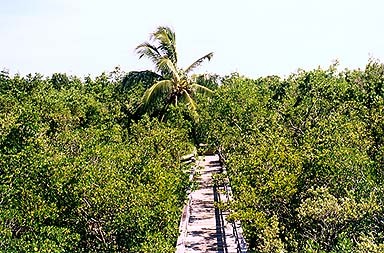 Long Key State Recreation Area is often overlooked by area visitors, and is therefore somewhat of a quiet haven. The Spaniards called it "Cayo Vivora" - Rattlesnake Key. The city of Key Colony Beach is a town of about 2,500 year-round residents located at MM 53.5. A nice feature is small, nine-hole golf course. This is the only golf course nearby, the next closest and the only other one in the Keys is in Key West. If you touch the poisonwood trees along the nature trail at Crane Point Museum and Nature Center (MM 50 Bayside), you will itch, much as if you had touched poison ivy. Nature trails wind through a 64-acre hammock, and there is plenty of information on the Keys' natural and cultural history. Tropical Crane Point Hammock consists of the Museum of Natural History of the Florida Keys, a children's activity center, the historic Bahamian House (1903), and the trails. Pigeon Key offers insight into life at the time of the construction of the railway to Key West (1910). Pigeon Kehy is listed in the National Register of Historic Places. The Pigeon Key Foundation, which operates the facility, encourages visitors to learn about the Florida East Coast Railroad, the fragile ecology of the Keys, how the seven-mile bridge was built, and the people who used to live on the island.